Watching this video, it takes me back to the 1960s in Montreal when we were going to change the world and build Utopia. We were totally in chardi kala and really believed we could make a difference. Looking back, we were naive and maybe a bit silly, but we were dedicated and strong and we believed - we knew - that we had to make a difference. For a while, it looked like we were wrong. We made no difference at all. Some got discouraged. Some quit trying. Some remained in chard kala. Then - 1984! It all fell to pieces. We were caught up in the violence in India. We fought. We died. Some lived to tell the story. It seemed that everything we had believed in, had dedicated our lives to, lay in ashes at our feet. Akaal Takht was in ruins, the evidence of our great history burnt by a bunch of thugs calling themselves the Army of India. Thousands dead, first in Amritsar, then in Delhi and elsewhere. Operation Woodrose. Operation Shanti? 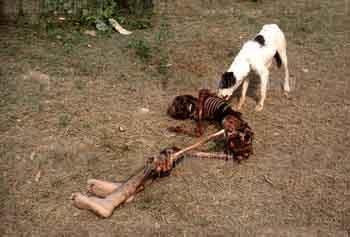 We realised that we, who had long fought for the rights of the oppressed and had gained independence for India, were despised, feared, looked upon as food for stray dogs in the street. We were stunned, stopped dead in our tracks. Ashes at our feet. Then we remembered that we are Sikhs. We can be killed, but we cannot be destroyed. Our recovery has been slow and painful. These past twenty-five years have been difficult beyond words. But words are all we have to express ourselves with. So we try. Difficult these years have been, but not impossible. We are still here. We are still alive. We are still vital. We are regaining that chardi kala that is one of the marks of the Sikh, as recognisable and as Sikh as our panj kakkars. I often hear my generation bemoaning the cutting of hair, the losing of identity, the lack of devotion among our young. These are problems, big problems and they must be faced and overcome. 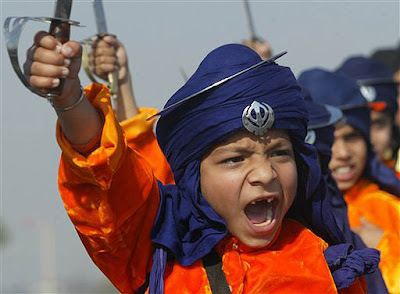 Then I think with great joy of my many young cyberfriends around the world, young Khalsa that who would make any generation of Sikhs burst with pride. They may not be many, but Guru ji will bless them and their ranks will grow. Our problems will be faced and overcome as we have done in times of crisis in the past. As the parents and grandparents (when did I get old enough to be a grandmother? ), we need to love and encourage these young people, teach them what we have learned. I have found that they are hungry to hear from the mouths and pens of the survivors what really happened in 1984. We are reluctant to speak, partly from our own pain and partly from a misguided desire to spare our children the pain of those years. This is their history and they have a right to it. We must share our experiences with them. This history is their birthright, as much as are the stories of Mughals. So, back in 1967, we were out to build Utopia. We haven't yet succeeded in that. It's not likely we will. There have been positive changes, however. The Canadian government has openly recognised the injustices done to us in the past. 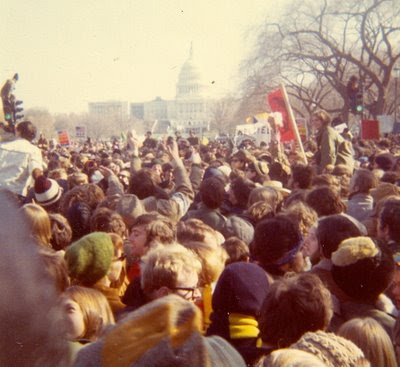 To the south, I watched with amazement the Presidential debate between a Black Senator and a White Senator in a university that had been integrated within my memory with bloodshed amid shouts of "Segregation today, segregation tomorrow, segregation forever!" 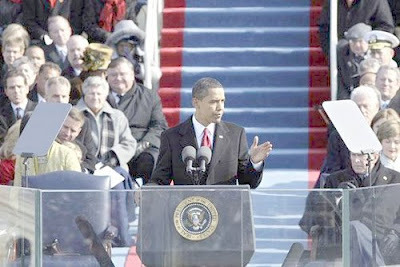 With even more amazement, I watched the inauguration of that same Black Senator as the President of still the most powerful nation in the world. We recently celebrated the 91st birthday of Nelson Mandela, former President of the Republic of South Africa. It is no longer unusual to see women in the governments of various nations. A woman is Chancellor of Germany. Have we done enough? Of course not! I do think that we need to stop a minute and acknowledge that we have accomplished something. And move on forward, refreshed and in chardi kala. This is what this song brought up in my heart and mind. into the future with our turbaned heads held high, a smile on our collective face and love in our collective heart. BTW, I am not endorsing this group, only presenting my thoughts on the video. There is so much presented here, it's hard to follow all the connections. I'm wondering I missed a comment section. 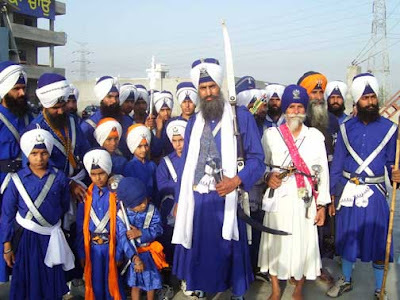 I loved the picture of the litte singhs, give boy a sword and watch them turn warrior. I wonder though if at the age they have any idea what it is a Sikh warrior fights for. Isn't it the battle within which must first be fought and won, with the voices of the 5 theives, cut down, slain, or mastered. Sukhmandir Kaur ji - This post is a sort of stream of consciousness piece. I had so many ideas chasing and leap-frogging each other that it is a bit jumbled, I'm afraid. We have lived confusing lives during confusing times. Still, they have been wonderful lives in wonderful (full of wonder) times. 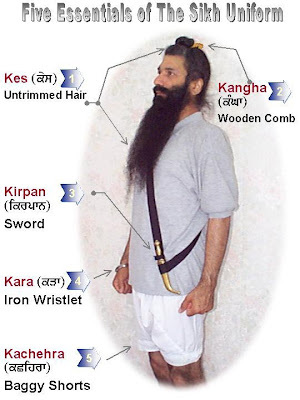 As for the little warrior...There is a reason we are called upon to be the sant-sipahi rather than the sipahi-sant. 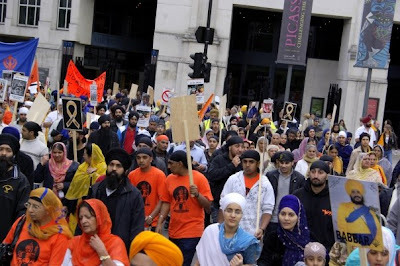 Our children need to be taught from their earliest years who and what they are as Sikhs. They need to be taught how to defend themselves and why, as well. As I say, we must instill in them that smile on their faces and love in their hearts. To succeed at both is a challenge to all of us, especially parents. For good or ill, these children are our future. You are a much kinder, gentler person than I am. I really admire that in you. For most of us, ifwe, if I waited until the Five Thieves were under control, we, I would be doing nothing else, as this seems to be a battle stretching over lifetimes. "The unbeatable foe," being, of course, those thieves lurking in the recesses of my reptilian brain. Much love and chardi kala!